The day has arrived once again– it is SRC-Secret Recipe Club Day! 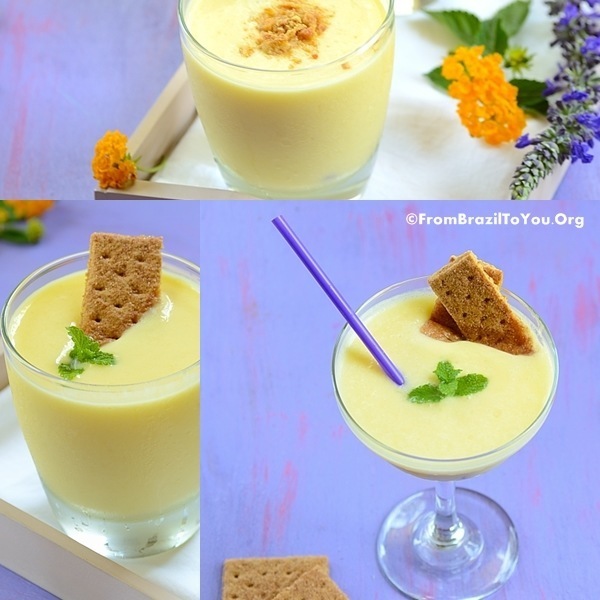 Our recipe for today is the guilt-free, refreshing, and outrageously creamy Piña Colada Cheesecake Smoothie (Vitamina de Abacaxi com Coco) which was inspired by the Strawberry Cheesecake Smoothies from Melissa’s Cuisine. This will be our fourth recipe since we started participating in the SRC. I still remember and will never get enough of our three other dishes from the club: Oreo Cookie Balls, Gnocchi with Collard Greens, Bacon, Grilled Corn, and Tomatoes, and Peanut Butter and Berry Waffles with Nutella Sauce. For those who may not know, Melissa’s Strawberry Cheesecake Smoothie won the vote for the Ultimate Fruit Smoothie recipe in June’s Crazy Cooking Challenge! Wow!!! This means that her smoothie recipe was the winner from among all the many other fruit smoothie recipes submitted by several different blogs, and of course I just had to feature that sip of heaven here. As you know, I love to put my own personal touch on others’ recipes and this time was no different. Although I absolutely love strawberries, I wanted to try Melissa’s amazing recipe with a tropical combination of flavors: Pineapple and Coconut, which is also known as Piña Colada. 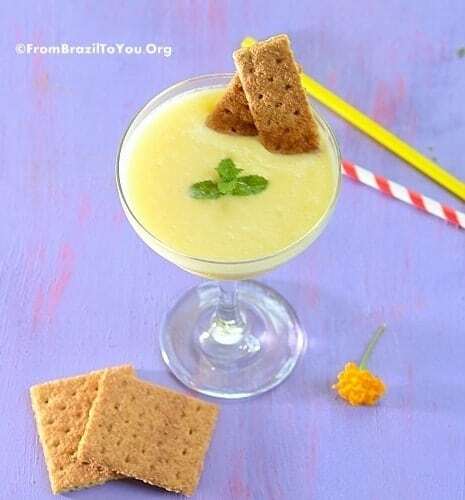 This nutritious Piña Colada Cheesecake Smoothie is extremely refreshing, which makes it ideal for warm days. It is literally like having a blissful, guilt-free dessert in a cup that is perfect for enjoying any time, including breakfast!!! Note: This recipe was adapted from Strawberry Cheesecake Smoothies from Melissa’s Cuisine. According to Melissa, the original source of the recipe is The Royal Cook. That looks so wonderfully cool and refreshing. I am putting this on my list of “to make” this summer. Yumm, yumm, yumm! I hope you enjoy it, Lail! Thanks for always stopping by. What a great recipe. Dessert for breakfast! I got a sweet tooth so when I tasted this smoothie in the morning for the first time, I got a huge smile on my face!!! This recipe just screams summer! Looks delicious! Sally: So sorry! Why don’t you try this smoothie with mango instead of pineapple?! I’m drinking a smoothie right now but I think I’d rather have yours! I never would have thought of adding cream cheese, how fun! Thanks, Chris! I hope you try this recipe next time!!! Cream cheese adds a lot of creamness to the recipe. Thanks, Liz! It’s a party in a glass which can be enjoyed right in the morning, at breakfast time. A perfect summer sipper – and light, too! What a great twist on my recipe! This looks absolutely delicious! I love pina coladas, and I’m sure I would love this. I am doing a smoothie round-up next week, would you mind if I include your recipe? Thank you, Melissa! You are welcome to include this Pina Colada Smoothie in the round-up next week for sure. You had me hooked at cheesecake smoothie. These look absolutely amazing- perfect for a hot summer day. Thanks, Karen! My husband and I have enjoyed this recipe a lot. I love piña colada and this look amazing!! Just need to get me some cream cheese and I’ll be whipping up these babies! Beautiful photos (as always Denise) – I just want to reach out and grab one of these! Thank you for stopping by, Daniela! I love your visits and comments. Pina colada! I have to admit I’ve been drinking quite a few Pina Coladas this weekend, and not the yogurt type. 🙂 I did have a good reason to celebrate, I promise! I was using the store bought mix, and just had a thought yesterday that I want to make one from scratch! And, here you are reading my thoughts! And, on a going forward basis, I’d rather consume Pina Colada in non-alcohol form. Pinned! Thanks, Julia! Enjoy this homemade, healthy version! Hi Denise! I was so happy to get your blog this month! I LOVE it! I have some more recipes bookmarked that I will have to try out ASAP! You Bolo de Banana was amazing… moist and decadent! 🙂 This smoothie sounds like a tropical holiday to me! Can’t wait to try it! It was real pleasure to have you making one of my recipes. You did an amazing job, making my cake shine. I enjoyed reading your post and looking at your beautiful photography. As I said earlier, I’ll never forget your cake plating…It was restaurant style!!! I hope you can try other recipes of mine in the future. I’d love to try yours as well. Wishing you a great week!!! What a refreshing and tasty drink! Loving this! Glad to be part of SRC group C with you! You made a good decision changing the fruits, yes, Piña Colada…!!! 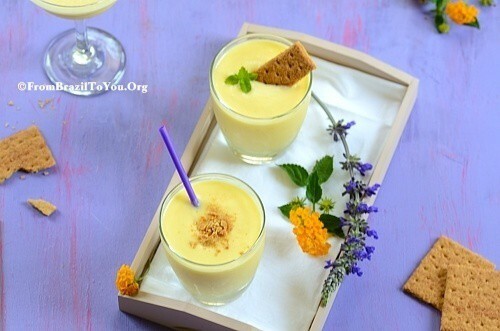 Adore the tropical flavors paired with cheesecake all bundled up in a refreshing smoothie! What a luscious way to begin a warm spring morning! Deb: It’s indeed a luscious way to start the day — with a huge smile on the face! I’d drink smoothies every day if this is how they were! Gorgeous! Thanks for stopping by and pinning it, Nami! I do appreciate it. This looks so yummy! But….stupid question…can you make a smoothie without yogurt? I hate yogurt. Thanks for stopping by. There is no stupid question!!! Yes, you can make smoothies without yogurt for sure. Although yogurt makes smoothies creamier, the fruit can be blended with the milk, sugar, and cream cheese (in this case). Traditionally, smoothies are a blend of fruit, milk, and sugar only. You can still have a creamy smoothie without yogurt if you don’t add a lot of milk (add just enough milk to blend the mixture). Have a great week! Sounds good and looks beautiful! Useful post and great responses. I also like “Piña Colada Cheesecake Smoothie (Vitamina de Abacaxi com Coco)” for the title. Another good post Denise. A Piña Colada is like a sweet cuddle from heaven and this smoothie is calling my name. I just love it! This sounds pretty much like my dream smoothie! They look so gorgeous too! What a lovely shake this is!!! It is really amazing and I cannot stop drooling 🙂 . Thanks Denise for the lovely, healthy and easy recipes you make, this one is a keeper. Pina colada cheesecake smoothie?!? That’s very creative and yum! Wow, I love this! This smoothie is going to rock in my family, as we love pina colada! Enjoy, Purabi!!!! This is a great drink. Thanks both Judith and Corina! It is good to have you visiting FBTY again. Enjoy the smoothie!!! How did I miss this deliciousness?! Holy moly, come to MAMA! Your Piña Colada Cheesecake Smoothie sounds delicious and so much fun to drink. 🙂 Can’t wait to make some this weekend. Thanks, Amy! I hope you do enjoy it…It is quite refreshing!Have a nice weekend. Wow, Denise, this smoothie has it all! So glad to have you stop by my blog so that I could find yours to follow along too! Have a beautiful day! Thank you, Roz! It was a pleasure to visit your great blog. Wishing you a wonderful weekend! Denise, this looks so delicious! I love the idea of a pineapple cheesecake for flavor here. What an amazing smoothie Denise! I love the pina colada flavors you have brought it. Thanks, Nik! It is a great versatile treat. Your smoothie variation looks great! Such a wonderful variation for a smoothie! I want that smooth, soothing dessert right now! OMG! Off to the kitchen…..! Thanks a bunch for this super glamorous recipe…can’t wait to try it! Hi, Hashem! I am glad that you enjoyed this drink.